That refused to grow tall and/or lush. Perhaps it just needed a push! P.S. This is a limerick. This poor crepe myrtle has been moved three times now, in an effort to settle it in just the right spot. Glad I didn’t give up on it! P.S.S. Time for a little blogging break — I’ll catch up with y’all soon! 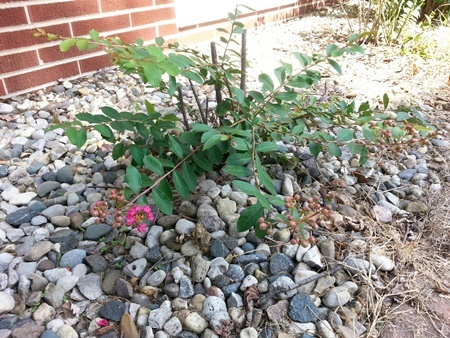 This entry was posted in Seasonal and tagged crepe myrtle, limerick. Bookmark the permalink. Third time’s a charm, as they say. I’m glad it seems happier now. Our crepes are starting to lose their blooms and form seed pods. Goldfinches go crazy for crepe myrtle seed, so as yours grows, it may attract some birdies, too. A fun sidenote: the title of the poem I wrote when I was senior class poet in high school was “Fruition.” One of these days, I’m going to tackle that whole story, and the decades-long gap between that poem and the ones I write now. I even have the poem, now, but I had to get in touch with my high school and have them copy it out of the yearbook — I didn’t have my own copy! I’ve seen Blue Jays picking at the seed pods, too, Linda. Funny, but I never noticed before that any birds relished crepe myrtle seeds! What a cool story about your poem! I hope you’ll follow through and tell us the rest of the story. I remember writing a few poems when I was a kid (10 or 12, I think), but after that, nothing because I was concentrating on prose and short stories. Isn’t it interesting how the brain doesn’t forget?? Come on little crepe myrtle, you can do it! Thanks for the encouragement, DD. I’m certain that will help! Thank you, my friend. I’ll be back soon and will catch up as I can. Not to worry. We’ll all be here. Love the limerick – and the little myrtle! Have a great break, Debbie! Thanks, FF — hope your own break was productive … and restful! Debbie, LOVE the limerick, LOVE the crepe myrtle…it’s beautiful! And kudos to you for not giving up because look…it grew! Enjoy your break, my friend. See ya when you return! Now you’ve gone and made me blush, my friend. Thanks so much for your high praise! It’s totally wonderful seeing this little crepe myrtle finally produce some flowers after all this time. I’ve heard that you can grow new ones from their seeds, and I just might have to give that a try — like I need more things to fret over, ha! I love the limerick also! Poor little myrtle, it just needs to embrace its new space. I love them, they are the state shrub of Texas. I didn’t know that! We had a couple when I lived there, but we brought them over from Mississippi. They seemed to love the long growing season, too! I think they do like it. I don’t have any, but I enjoy a lovely row of pink ones my neighbor has beside my driveway. What a fun post!! Hope the new spot works! Enjoy your break, Debbie. Thanks, Audrey … I’m going to try! We have a crepe myrtle at the lake. I didn’t know birds liked the seeds…guess we’re not there enough to notice. I’ll keep watch now. Enjoy your break! Thanks, Dawn. I was surprised to see that jay with one of the seed pods in his mouth, looking for all the world like he’d found a real prize, ha! We all need those breaks now and then! See you when you get back! Thanks for understanding — see ya soon! I think you must pluck it. That’s a great idea for an assignment, Monica, and how fortunate you are to have had such a thoughtful teacher! Sadly, too much homework becomes repetitious boredom (another topic for another day, I guess). Anyway, you’re probably being too hard on yourself. I’ll bet you can write poetry with the best of them — go ahead, that’s a challenge, ha!! I’m afraid I’ve been on a blogging break myself for a spell, but with good reason. I was on a 2 1/2 week road trip with my youngest daughter. Sounds like you’ve gone to spend time with your son. Aren’t grown children wonderful? And happy your crepe myrtle is finally flowering – tenacity with gardening, as with so many aspects of life, pays off in the end. I have missed you, my friend! However, I’m glad you were enjoying a road trip with your daughter — YES, adult kids are the very best! !